I had lofty aspirations with these pancakes, nearly all of which fell flat on their faces. First, I’d wanted to make it egg-free: not using any egg substitutes as I have practically nil right now but quickly found that these pancakes do need that structure so these pancakes are no longer egg-free. Other than that, my only other thing was that I’d imagined the pancakes differently somehow but these ones turn out almost like the flourless banana pancakes. They taste like them, too, but with the addition of coconut flour and some other ingredients. What I did like having the opportunity of though was that I could make itty bitty pancakes and put them here. I don’t know about you, but it almost seems that smaller pancakes are more filling or perhaps that’s just due to the perception that there’s more. Sort of like sweet petites: they’re small but just big enough to satisfy. 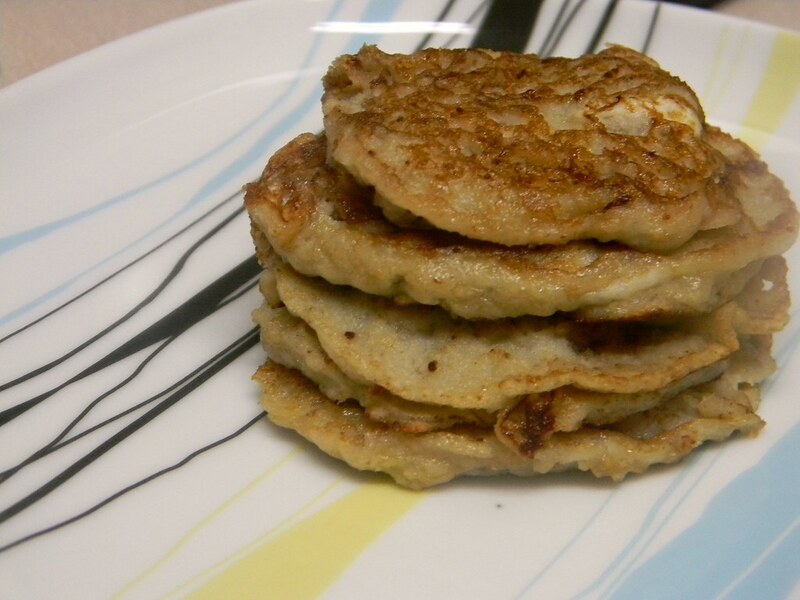 The recipe that these pancakes are based off is from Cooking with Coconut Flour: a book that explains how to use coconut flour and is filled with a large number of recipes that use coconut flour almost exclusively and most are SCD friendly or are easily adaptable. Recipe Index I’ve updated and reorganized the recipe index, which also includes greatly simplifying it. I don’t know about you but I was finding it was becoming cumbersome and too specific. Too many categories for me to keep on top of! I’ve also made a new category for kitchen techniques and other how-to’s I’ve done here, which has its own page separate from the recipes. Twitter I’m back on Twitter! The welcoming and feedback has been enormous and I thank you all so much. I missed you, too. (Commenting on each others’ respective blogs isn’t quite the same!) You can follow me now, again, @zscupoftea. Adapted from Cooking with Coconut Flour by Bruce Fife, N.D. If you don’t want to use almond milk, you can use an equal amount of coconut milk as in the original recipe. The lemon juice helps activate the baking soda as well as preventing the batter from browning completely from the banana. Sifting the coconut flour is important because it removes any clumps: unlike other flours, coconut flour clumps are packed tightly and don’t fall apart in wet mixes. You have to be sure to break them up if you don’t sift first. Mash the banana and mix it with the oil and almond milk in a bowl. Mix in egg. Add the lemon juice and baking soda. Sift in the coconut flour. Heat a small amount of oil in a fry pan over medium heat. When hot, spoon the batter into the pan – generally, one spoonful per pancake, with each pancake about 2 1/2 to 3 inches in diameter. Cook until the top has bubbles forming and set, looking nearly dry. Flip over to cook the other side until brown or golden brown, carefully sliding the flipper underneath the pancake to keep their circular shape. Transfer to a plate and serve. Enjoy! Hi Lisa, thanks for catching that! There is indeed supposed to be an egg in the recipe. It’s been fixed. this is how I make mine too 🙂 I experimented for a while to come up with a pancake that didn’t make me feel tired all day and the banana, coconut flour combo seemed to work great. Its good in the the texture department as well. I love the pics! Hi Melanie, yes, coconut flour is great. I love working with it. Thanks about the pics! I can’t have eggs nor flax seeds. What would you recommend?? Hi Amber, I have a post with three different egg replacers: https://zscupoftea.com/2010/08/25/3-diy-egg-replacers-for-baking-2/ I hope that they work for you! Thank you! I don’t own a sifter, what will happen if I don’t sift the flour?? If you don’t own a sifter, you can use something else like a tea strainer as long as the holes are small enough, which is what I used, or mix it separately in a small vessel or container, using a whisk or your fingers to make sure there aren’t any lumps of coconut flour. (If you’re using your fingers, just pick up the lumps of flour between your fingers and squeeze.) It’s important to sift and break up the lumps in the coconut flour, as they won’t be mixed in to the batter like other gluten-free flours or even wheat flour, and you’ll have them in your pancakes. I don’t know if I was supposed to add the extra 1/4 tsp of baking soda since I used the #2 egg replacer that you linked me, but this didn’t turn out like it should have. How should the consistency of the batter be before putting it on the pan? Mine was very gluey/sticky and It was like mashed potatoes. I only tried making 3 pancakes, until I just quit and threw the rest away. Help! What did I do wrong??? Hi Amber, I’m sorry that it didn’t work for you. Since you’re using the second egg replacer and that uses 1 teaspoon of baking soda, the extra 1/4 teaspoon isn’t necessary. Coconut flour absorbs moisture, which is why baking recipes that use it will also use a lot of eggs, usually. Because you’re using an egg replacer, I would suggest reducing the coconut flour to about half the amount ordinarily used (so, 1 1/2 tablespoons instead) and add it in a little at a time, mixing as you go, until the batter is thick enough to be poured or ladled, even if you haven’t used the full 1 1/2 tablespoons. If it is still too thick, try adding a little more oil for moisture. Hope that this works for you! How much more oil do you recommend??? These did not work at all. I followed the recipe to a t. I couldn’t flip them cuz they were mushy but they were brown. I’m sorry to hear that – it’s been a while since I’ve made these particular pancakes, but sometimes I don’t always get them to flip and they end up looking more like scrambled eggs than pancakes. These were really great! I used olive oil, vanilla extract instead of lemon, and almond coconut milk. Had to add a little extra milk. My husband loved these and was delighted at nutritional value! Great simple recipe and I really appreciated the small quantity, perfect for the two of us! Are you positive it’s only 3 tablespoons of coconut flour? Yes, just 3 tablespoons! I know it sounds like that isn’t enough but what you’ll find with coconut flour is that it is very absorbent, so you won’t need very much. These had a good flavor. Took a long time to cook to dry them out a little.flipping was not a problem after they dried a little. Low heat keeps them from browning too much before they were flipped.